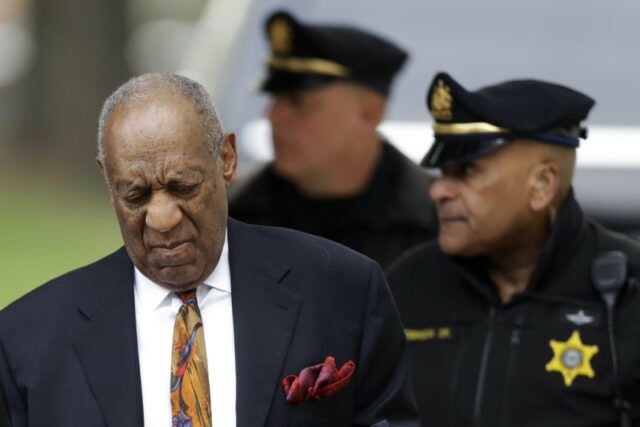 NORRISTOWN, Pa. (AP) — Bill Cosby’s chief accuser could have been made woozy either by the cold and allergy medicine Benadryl or by quaaludes, a prosecution expert testified Thursday at the comedian’s sexual assault retrial. The identity of the pills that Cosby gave Andrea Constand before a 2004 sexual encounter at his home has been one of the case’s most enduring mysteries. Dr. Timothy Rohrig, a forensic toxicologist, testified Thursday that Benadryl’s main ingredient can cause sedation, “mental clouding” and even short-term amnesia, as well as muscle weakness and clumsiness. He said Benadryl’s manufacturer indicated it produced the medication in blue tablets until 2010. The company’s website shows that an “allergy plus congestion” variety currently comes in blue. She testified that Cosby refused to tell her what they were when she confronted him about two months later. Her mother testified that Cosby told her in a January 2005 phone conversation that he’d have to look at a prescription bottle and would send the answer to her by mail. Rohrig, the director of a regional forensic science center and medical examiner’s office in Wichita, Kansas, called quaaludes “an old-timey sedative, hypnotic drug” that at one time were believed to be an aphrodisiac. Quaaludes have been illegal in the U.S. since 1982. They’re still legal in Canada and parts of Europe, Rohrig said. The expert testimony came on the ninth day of Cosby’s retrial on sexual assault charges that could send the “Cosby Show” star to prison for years. A day earlier, Cosby’s lawyers began their case by calling their star witness to the stand, countering the harrowing accounts of a half-dozen accusers with a woman who says Constand mused about framing a celebrity in hopes of a big payday. Temple University academic adviser Marguerite Jackson testified that Constand, Temple’s women’s basketball operations director, spoke to her on a February 2004 road trip to Rhode Island about fabricating sexual assault allegations against a high-profile person so she could “get that money” from a lawsuit. Cosby paid Constand nearly $3.4 million in 2006 to settle a civil lawsuit, and his lawyers call her a “con artist” who set him up. Cosby’s lawyers lost their fifth bid for a mistrial over the prosecution’s treatment of Jackson. The defense argued Thursday that prosecutors were out of line for implying they were wrong to help Jackson write a statement outlining her claims about Constand. Prosecutor Stewart Ryan irked Cosby’s lawyers during Jackson’s cross-examination on Wednesday by repeatedly saying they “created” her affidavit. Judge Steven O’Neill said there were “simply no grounds for a mistrial” and that Cosby’s lawyers were raising the issue too late. He added that it didn’t appear the defense did anything wrong, nor were prosecutors wrong to question their involvement. O’Neill blocked Jackson from taking the stand at Cosby’s first trial last year, ruling her testimony would be hearsay after Constand told the jury that she did not know her. That trial ended without a verdict after jurors deadlocked. The judge changed his mind about Jackson for the retrial, giving the defense case a huge boost. O’Neill was upset that Cosby’s lawyers had just one witness ready to testify on Thursday — a drug expert who was scheduled to take the witness stand after Rohrig, the prosecution drug expert. District Attorney Kevin Steele also expressed his displeasure and wanted O’Neill to make sure sequestered jurors weren’t blaming prosecutors for wasting their time. “Are you going to tell the jury that it’s their fault?” Steele asked the judge. “My fault. No. Their fault? Yes,” Cosby lawyer Tom Mesereau retorted.